After 25,000 Amnesty supporters called for the release of Mohammad Abu Sakha, the 24-year-old circus performer and teacher has been freed. He was held for two years in administrative detention without charge. Mohammad was arrested on 14 December 2015 on his way to work at the Palestinian Circus School where he worked with children with learning difficulties. He had been detained ever since, never charged with a criminal offense not tried for any crime, common practice by Israeli authorities in a system of abuse aimed to keep people behind bars without allowing them to access to justice. After a year in detention, high court judges told his lawyer that secret ‘evidence’ supported claims that Mohammad posed a ‘threat to the security of the State of Israel’. However, the system of administrative detention means that neither Mohammad or his lawyer could review 'evidence' against him, and therefore were unable to defend the case - violating the central principle of a fair trial. 25,000 Amnesty supporters emailed the Israeli authorities, calling on them to charge or release Mohammad. 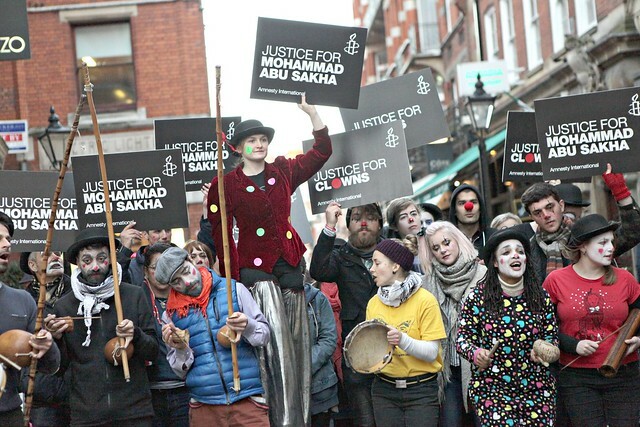 Amnesty UK also protested with circus performers by the Israeli Embassy in London, showing solidarity with Mohammad and the Palestinian Circus School. Egypt: Human rights defender Tarek Hussein freed from prison! Our father is brave. We wait for him with hope in our hearts.